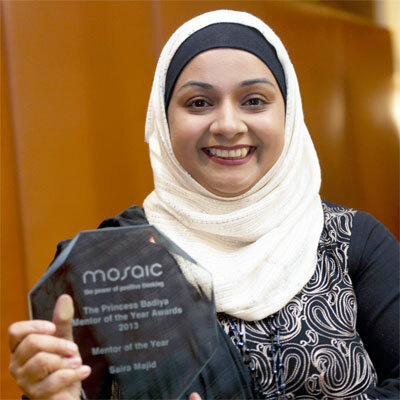 South East entrepreneur and Mosaic Mentor of the Year, Saira Majid, has some advice for young women on how they can smash the glass ceiling in business, and break down the cultural barriers to success. I have run my own accountancy business for over 10 years, I am mum of three young children, and I am a Mosaic mentor. Needless to say I wear a number of different hats, well actually I wear a headscarf or hijab. Yes it was that “look”. Believe me I know the look, I have seen it many times! Needless to say, I am good at what I do and I was able to convince them and subsequently walked away with a contract. To be honest, our biggest critics are sometimes from men and women, within our own community, but I will save that rant for another time. Welcome to my world, there is always some kind of challenge to deal with but I have never let that hold me back, in fact, I embrace who I am, I celebrate the fact that I am a “Muslim Mumpreneur”. Most of my clients are in fact English, and they soon come to realise that I am not that much different to them, I am faced with all problems and hurdles any mother, wife and business women would face. Last year, I was honoured to be awarded the title “Princess Badiya Mosaic Mentor of the Year 2013”. I have been mentoring with Mosaic for 4 years, mainly on the Enterprise Challenge. Initially it was part of my CSR strategy, as a small business I did not have the time to start a community project. Mosaic provided a ready-made platform for me. It was a simple way of reaching out to young people who are in need of positive role models. Being a Mosaic mentor has changed my life for the better, as I am passionate about helping others. Since winning the award, I have had dinner with royalty, been in the press, talked about on Social Media, interviewed on the radio and have even given a speech at the Foreign and Commonwealth Office. I never dreamt my life would take this direction. I never set out to win a national award. It was always about helping young people, and I did it with passion. My message to the kids I mentor is simple, be the best of who you are, put yourself out of your comfort zone, and be passionate about what you do. There are three options after leaving school, further education, employment or there is a third route, one that worked for me, that is to start your own business. It has been said that women in business are faced with a glass ceiling, and I would like to add that Muslim Women who decide to become entrepreneurs, have to work at it 100 times harder! But I am proud to say that there are many successful Muslim women in business, we are making a difference and we are smashing that glass ceiling.